AIB, one of Ireland's "big four" banks, is set to be taken into state control after the high court approved a 3.7bn euro (£3.15bn) capital injection. The agreement of AIB is needed before the funds are transferred. The move has been approved under the Credit Institutions Stabilisation Bill and by the European Commission. Once finalised, AIB will join Anglo Irish Bank, EBS and Irish Nationwide as the fourth financial institution brought under the control of the state. The funds are to be transferred from the Republic's National Pension Reserve Fund. Allied Irish Bank put its UK operations up for sale in March. First Trust is the bank's Northern Ireland business. Although AIB has sold its operations in the US and Poland in a bid to raise capital, continuing losses have more than doubled the bank's capital requirement to 15bn euro (£12.8bn). 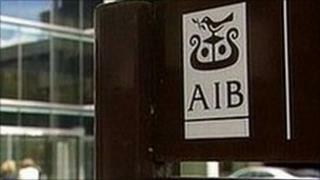 AIB received a 3.5bn euro (£2.97bn) bailout from the Irish government in 2009.